Working with an agency isn’t always easy. As you explore the agency landscape and try to figure out which agency is the best fit—even if it isn’t the one you’ve already hired—the learning process never ends, and can be daunting for that reason. That’s why Hanapin Marketing, well-known as the agency that other agencies turn to, put together this guide for making sure the agency you work with, or switch to, is as beneficial as possible. Whether you’re hiring a new digital marketing agency or looking to improve your current agency relationship, Hanapin Marketing’s longstanding expertise and reputation as the agency that other agencies turn to can provide you with invaluable knowledge. 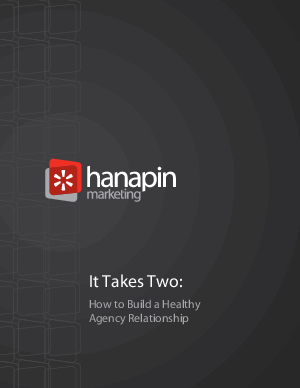 In this guide to building a healthy agency relationship, Hanapin provides best practices and long-established wisdom about what your agency relationship should look like—including what your agency should be doing, and just as importantly, what you can do to help your agency.